When 2 atomic bombs are stolen by SPECTRE with the threat of detonation in a British or American city, it is down to Bond and his allies to find the bomb's and stop those responsible. The Royal Air Force makes a test run with their Vulcans, armed with nuclear missiles. With a clever plan, SPECTRE´s pilot Angelo Palazzi hijacks the bomber, kills the crew and lands in the ocean. Largo kills him inside the plane, because Palazzi wanted too much money. The SPECTRE guards take the nuclear missiles and cover the plane. Later, Bond finds it. Two aircraft can be identified: XA913 and XH506. XA913 used on the ground which Palazzi and the crew board. XH506 used for aerial scenes. When they are searching for the missing Vulcan, James Bond and Felix Leiter use this helicopter. Registration N1190W, c/n 3302. Felix Leiter uses this helicopter with US Coast Guard markings to rescue Bond. Serial 1388, c/n 62069. Registration N809Z, serial # 44-83785, c/n 32426, built in 1945. Carried registration N207EV from 1975 onwards after it was acquired by Evergreen Helicopters and used as a water bomber. At the end of the movie, this unmarked B-17 appears and drops the rescue-system "when arrows meet". 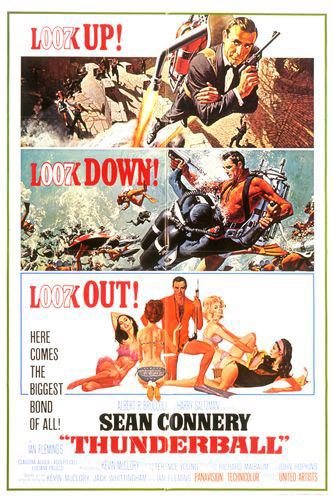 This is a life raft, which has one special function: Bond sends up a big inflatable arrow, which has a rope connected to Bond and Domino. Then the B-17 returns and a special fixture collects the rope and pulls Bond and Domino with them. This particular aircraft was used to develop the Fulton Skyhook system used in the movie. This system would later become standard on Special Operations variants of the C-130 used by the USAF. Today, this aircraft has been restored to WWII configuration and is on display at the Evergreen Aviation Museum in McMinville Oregon with the name Shady Lady. This page was last modified on 14 January 2018, at 19:11.